Also, the loosed ‘macro-grains’ look so dissimilar. As if mixed shells on a whole cereals store. 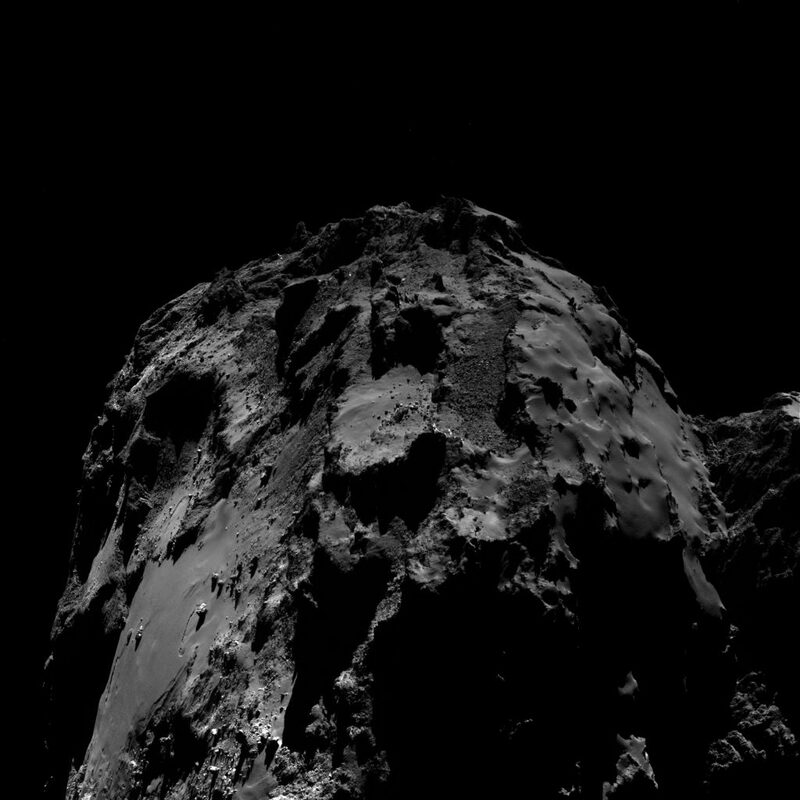 I swivelled the main NAVCAM photo at the top of this post by 90° so that it was in ‘upright duck’ mode with the head lobe above (but out of frame). I saw some interesting things that are almost impossible to see when the photo is side-on. There’s a 700-metre long wavy feature that has the same profile as another one 300 metres away. The two lines exhibit several small-scale matches which precludes an eroding front of such a distance. It’s rather telling that the upper line is contiguous with the edge of three trays which I’ve identified as the head lobe shear line. 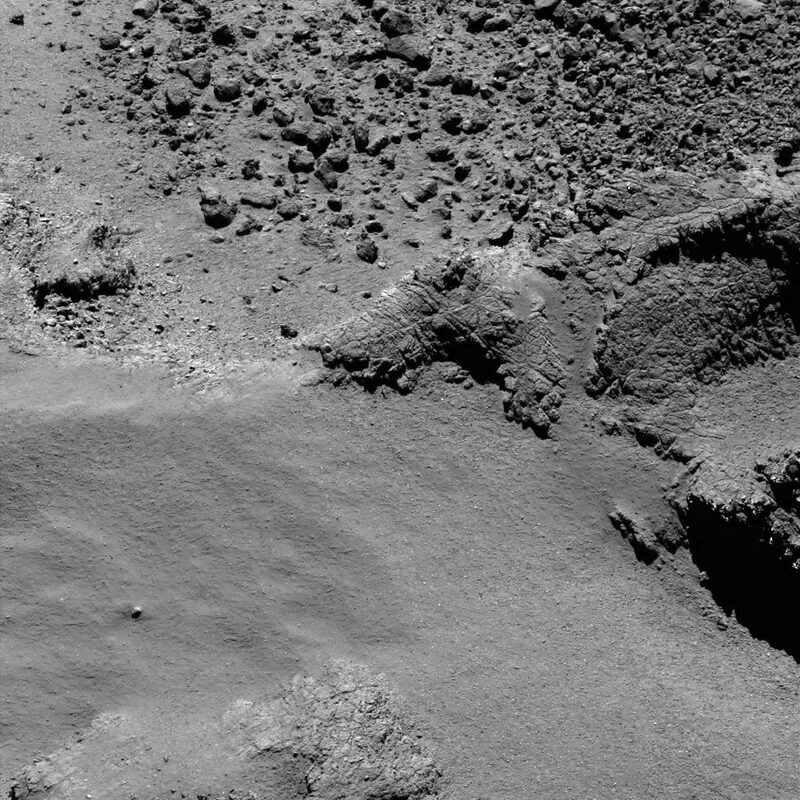 This is according to stretch theory which is not accepted by the Rosetta mission. That’s my standard occasional caveat for any readers here who are only interested in peer reviewed literature. The three trays are the ones from which three nominally scalloped features on the head rim broke away. I’ve matched the trays to the scallops at least three times in comments on the Rosetta blog over the last year and they’ve been done on photos from completely different viewpoints. After the first one, Harvey said it might not hold up from another viewpoint. On the second one, Gerald said much the same thing. On the third one, six months back there was no comment. Now it appears that the apparent seating for this 300-metre crust slide is not only contiguous with the former head/3-scallop seating on the body but its present day position dictates that the slide must have been in the exact opposite direction to the hypothesised head lobe lift-off at the shear line. This is consistent with all such purported slides discovered to date. It’s also consistent with the tensile force vectors in a stretching comet. This is why I’ve said that all such explanations in stretch theory are complementary to their neighbouring regions as dictated by the constraints of the tensile force vectors during stretch. A.Cooper: I found the upright duck from Part 54 (Atum crust) with the matches you point out striking. Sliding ices underneath is an ingenious explanation. Suppose some reasonably large amount of ices (tens or hundreds of metres) sublimate, in some explosive event. What would be the response in the ice in the neighbouring region? 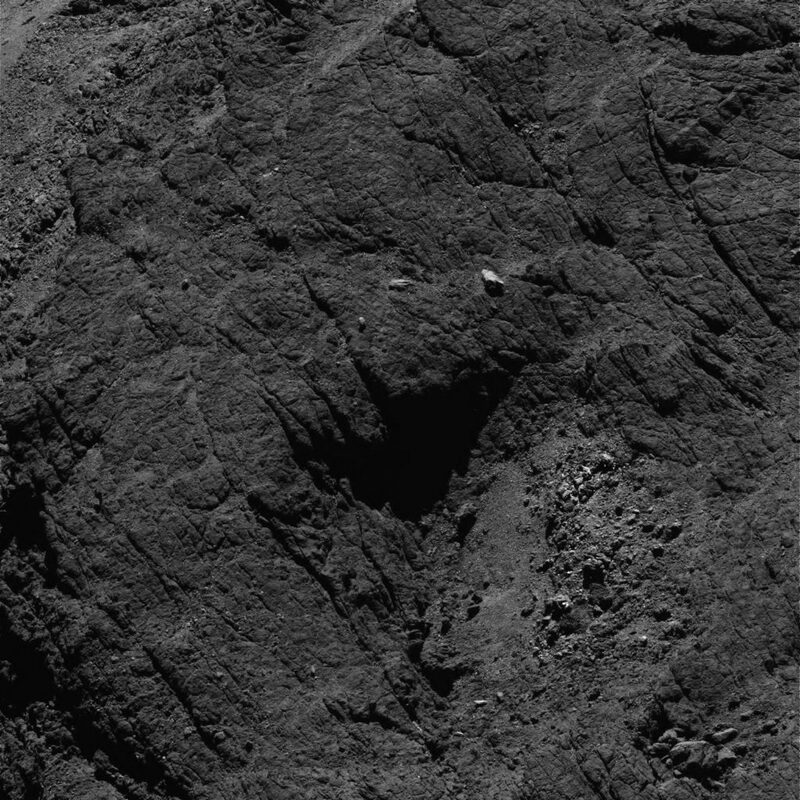 Not clear to me that sliding might happen, I think we know relatively little about material inside a comet nucleus. 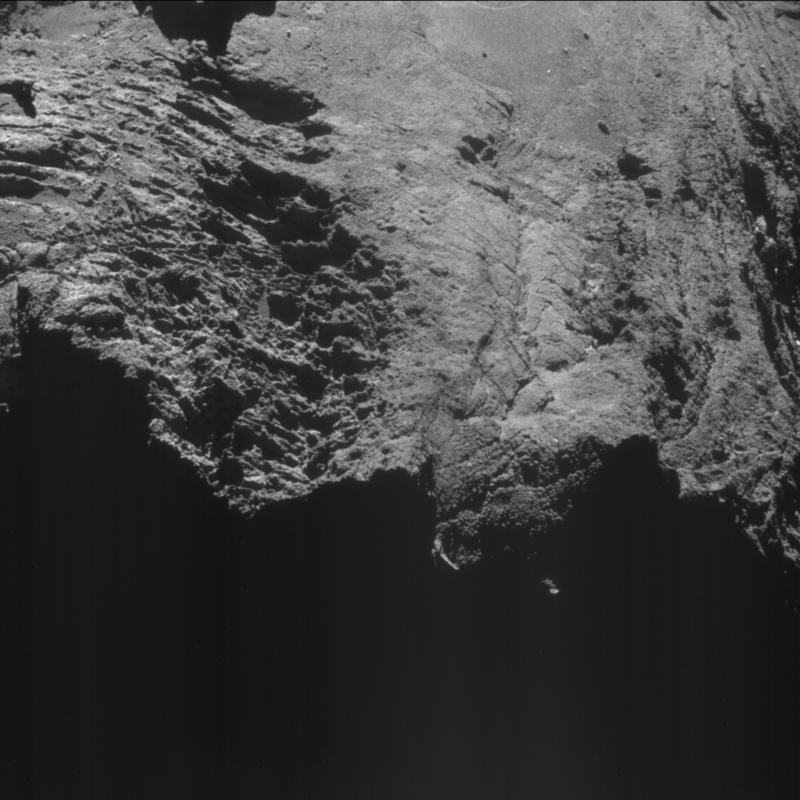 A. Cooper: Cometwatch 11 September (Navcam image) and the Osiris image taken on 17 September both suggest sliding.